If you’re looking for a versatile carry pistol that is packed with features, has amazing capacity, and performs flawlessly, look no farther than this compact pistol. The XD(M)® 3.8” Compact is the smallest of the XD(M)® line, but it’s by no means the least. It boasts the same superior ergonomics, reliable performance, and features that make larger XD(M)®’s easy and intuitive to use in a slightly abbreviated package. And you’ll be amazed at how fun it is to shoot. 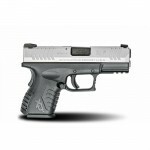 The XD(M)® 3.8” Compact has a 3.8 inch barrel mated with a shortened compact frame. When combined with the versatility of XD(M) Gear® X-Tension™ (USPAT7191556) magazines, the XD(M)® 3.8” Compact is ready for daily carry or a day on the range. Put in an X-Tension™ (USPAT7191556) magazine, and you have a 19 round full-sized 9mm pistol (16 rounds in .40SW, 13 rounds in .45ACP.) Use the flush-fitting 13 round magazine, and you have a Compact (11 rounds in .40SW, 9 rounds in .45ACP.) Like all XD(M)®’s, the XD(M)® 3.8″ Compact comes with three interchangeable backstraps, dovetail sights, mega-lock frame texturing, an ambidextrous magazine release, a multi-position frame rail, and a match grade barrel.You’ll also find all the safety features that make the XD(M)® a safe pistol in responsible hands. If you want a gun for daily carry as well as a trip to the range, but you only want to buy one gun, try the XD(M)® 3.8” Compact. 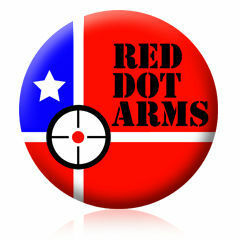 You’ll be amazed at how controllable it is to shoot and how easy it is to conceal. It’s two guns in one. Mossberg 500 Persuader 12GA – Free Shipping – No CC fees.